Our bodies are filled with iron: iron in hemoglobin colors our blood bright red and iron is used as a chemical tool in many cellular proteins. Altogether, we have several grams of iron scattered through our cells. Surprisingly, however, lack of iron often limits the growth of pathogenic bacteria infecting our bodies. This is by design: our bodies have evolved to guard their store of iron, so the amount of free iron circulating through the body is vanishingly small. As you might expect, however, bacteria have evolved methods to fight back and obtain the iron that is essential for their growth. 70% of our iron is found in hemoglobin, which carries oxygen in our red blood cells. 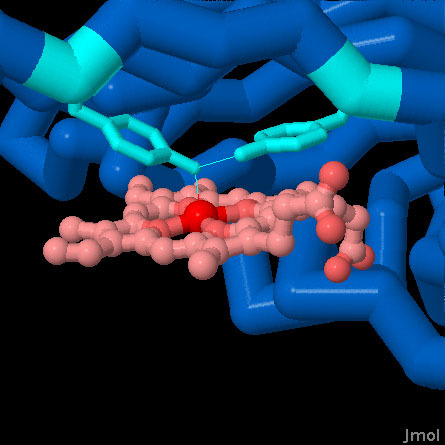 This iron is bound tightly in heme, a small, planar molecule that holds the iron ion at its center. Bacteria have developed an elaborate system for gathering this hemoglobin-bound iron and delivering it into the bacterial cell. 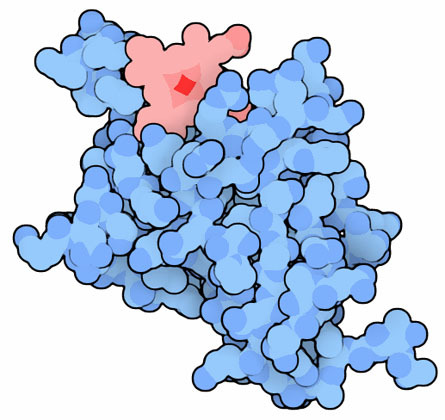 Hemophores, such as the one shown here from the bacterium that causes anthrax (PDB entry 3sik), scavenge through the blood and extract heme groups from any hemoglobin that they find. Hemophores are assisted by a variety of other proteins. In some bacteria, hemolysins are used to break red blood cells, releasing the hemoglobin. Hemophores then bind the hemoglobin and extract the heme, as shown here at the top (PDB entry 3szk). 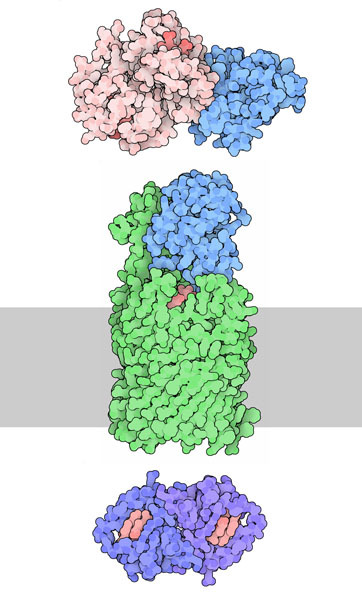 The hemophore then binds to specific receptors (shown in green) on the bacterial cell surface, which transport the heme inside (PDB entry 3csl). Finally, inside the cell, the heme may be used in bacterial heme proteins, or it may be broken down by heme oxygenases, which release the iron as they degrade the surrounding porphyrin. Several structures of these heme-degrading enzymes have been solved by PSI researchers. Two early structures from MCSG revealed dimeric enzymes with two active sites (PDB entries 1sqe and 1xbw, not shown here). A recent structure solved by researchers at UC4CDI shows a tuberculosis heme-degrading enzyme trapped in an unusual inactive conformation with two hemes in each of the active sites, revealing the extensive flexibility of the surrounding protein (PDB entry 3hx9, shown at the bottom). The structure of the anthrax hemophore, solved by researchers at UC4CDI (PDB entry 3sik), reveals a binding pocket that grips the heme group. Two amino acids lock the heme in place: one tyrosine coordinates directly with the iron atom and a second tyrosine strengthens the interaction by making the coordinating tyrosine more electronegative. To look at this interaction in more detail, the JSmol tab below displays an interactive JSmol. The complex of an anthrax hemophore with heme is included in this structure. Two tyrosine amino acids, shown in bright turquoise, form a specific interaction with the iron atom in the heme (shown in red). Use the buttons to view the whole protein, and to display all of the atoms. Ekworomadu, M. T. et al. Differential function of lip residues in the mechanism and biology of an anthrax hemophore. PLoS Pathogens 8, e1002559 (2012). Kumar, K. K. et al. Structural basis for hemoglobin capture by Staphylococcus aureus cell-surface protein, IsdH. J. Biol. Chem. 286, 38439-38447 (2011). Chim, N., Iniguez, A., Nguyen, T. Q. & Goulding, C. W. Unusual diheme conformation of the heme-degrading protein from Mycobacterium tuberculosis. J. Mol. Biol. 395, 595- 608 (2010). Nairz, M., Schroll, A., Sonnweber, T. & Weiss, G. The struggle for iron - a metal at the host-pathogen interface. Cell. Microbio. 12, 1691-1702 (2010). Krieg, S. et al. Heme uptake across the outer membrane as revealed by crystal structures of the receptor-hemophore complex. Proc. Natl. Acad. Sci. USA 106, 1045-1050 (2009). Wu, R. et al. Staphylococcus aureus IsdG and IsdI, heme-degrading enzymes with structural similarity to monooxygenases. J. Biol. Chem. 280, 2840-2846 (2005).